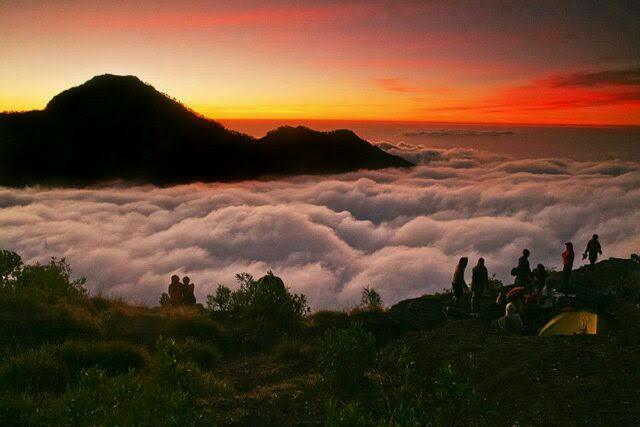 Mount Rinjani is a mountain located on the island of Lombok, West Nusa Tenggara. 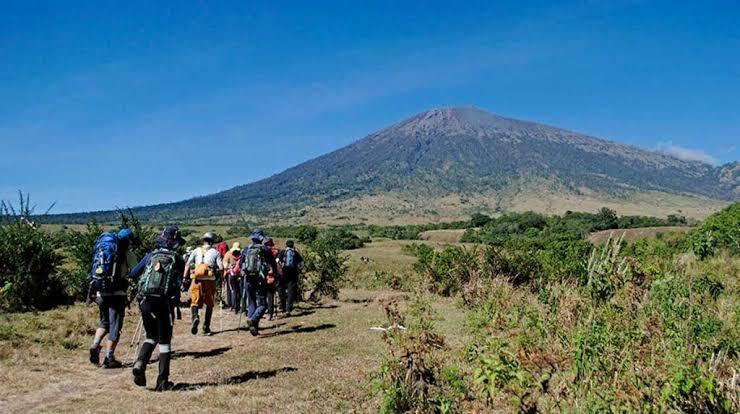 Mount is the second highest volcano in Indonesia with an altitude of 3726 m above sea level and located at latitude 8 º 25 ‘LS and 116 º28’ BT is a favorite mountain for Indonesian climbers because of the beauty of the landscape. This mountain is part of Mount Rinjani National Park which has an area of ​​about 41,330 ha and this will be proposed addition to 76.000 ha to the west and east. 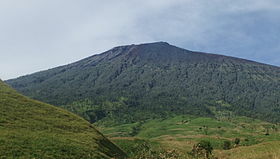 Administratively, this mountain is located in three districts: East Lombok, Central Lombok and West Lombok. Mount Rinjani with the highest point of 3,726 m above sea level, dominates most of the landscape of the northern island of Lombok. 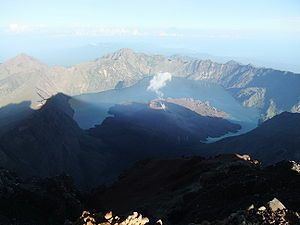 To the west of the cone Rinjani there is a caldera with an area of ​​about 3,500 m × 4800 m, extending towards the east and west. In this caldera there is Segara Anak (Segara = sea, lake) area of ​​11,000,000 sq. M with a depth of 230 m. The water that flows from this lake forms a very beautiful waterfall, flowing through a steep cliff. In Segara Anak there are many goldfish and mujair so often used for fishing. The southern part of the lake is called Segara Endut. 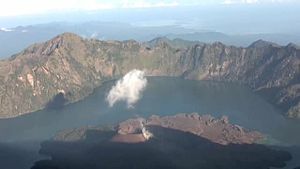 On the east side of the caldera there is a New Mountain (or Mount Barujari) which has a crater measuring 170m × 200 m with an altitude of 2,296 – 2376 m above sea level. This small mountain last erupted on October 25, 2015 and November 3, 2015, having previously recorded the eruption in May 2009 and in 2004. If the 2004 eruption did not take any casualties, the 2009 eruption had killed 31 people indirectly, because of the flash floods in Kokok (Sungai) Tanggek due to lava pressure to Segara Anak. Previously, Mount Barujari ever recorded erupted in 1944 (at the same time its formation), 1966, and 1994. In addition to Mount Barujari there is also another crater that ever erupted, called Mount Rombongan. Stratigraphically, Mount Rinjani is lined with Neogen Clastic sedimentary rock (including limestone), and localized by Oligo-Miocene volcanic rocks. The Quaternary volcano itself mostly produces pyroclastic, which in some places lays with lava. The lithology records some of the known omissions in history. Since 1847 there have been seven eruptions, with the shortest rest period of 1 year and the longest 37 years. As with other volcanoes, Koesoemadinata (1979) mentions that the activity of Rinjani kegunungapian post caldera formation is rebuilding. Its activity is efusiva that produces lava and eksplosiva that form the deposition of loose material (pyroclastic). Lava is generally black, and when it is melted it looks like foaming. Post eruption of caldera formation is relatively weak, and lava released by cone G. Barujari and G. Group is relatively more alkaline than other volcanic lava in Indonesia. The possibility of a hot cloud when eruptions peak is very small. Eruption materials are generally deposited on the inside of the caldera only. Lava flows, eruption lava, rain lava, and hot clouds have the opportunity to lead to White Kokok to Batusantek. 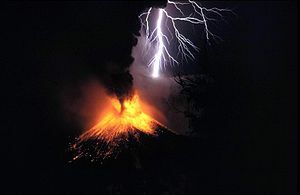 Thunderstorms can occur along the lava of a new moving lava, although the odds are small. The shape of the Segara Anak caldera which is tilted toward the east-west is thought to be related to the crack structure in the bedrock. Volcano Rinjani located in the volcano route Quaternary Banda Banda system In the western part formed by the basic activities of the Indian Ocean beneath the edge of the South East Asian Plate. The southern point of view indicates a north-south trending force. The west-east-trending rock-based crevices, which affect the caldera’s rise, are thus interpreted as a release crack caused by the pulling force. The structure was at least formed from the beginning of the Quaternary Period. 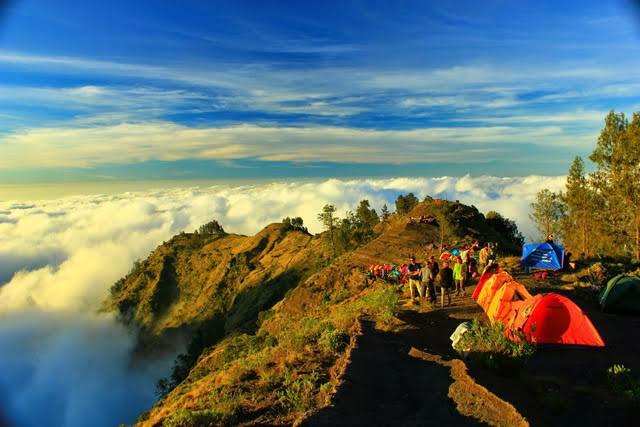 Climbing Mount Rinjani (peak) is one of the attractions that become a mainstay in the area of ​​Mount Rinjani National Park. Mount Rinjani as volcanic volcano is still active number 2 highest in Indonesia. 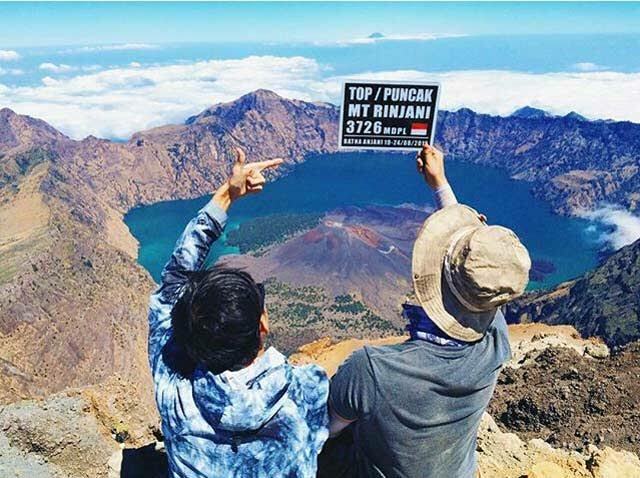 The peak of Mount Rinjani is the destination of most adventurers and nature lovers who visit this region because when it has reached the peak it is a pride of its own. The interest of the community of nature lovers throughout the archipelago even from abroad in the climbing activity is quite large, this is evidenced by the number of visitors who make the climb every year has increased. Massive climbing activity conducted in July to August, in August (mid) climb participants are generally dominated by students from all over Indonesia who want to celebrate the Independence Day of the Republic of Indonesia at the summit of Mount Rinjani and Lake Segara Anak through activities “Tapak Rinjani” which is held regularly every year by one of nature lovers group in Lombok Island in cooperation with Balai Gunung Rinjani National Park. 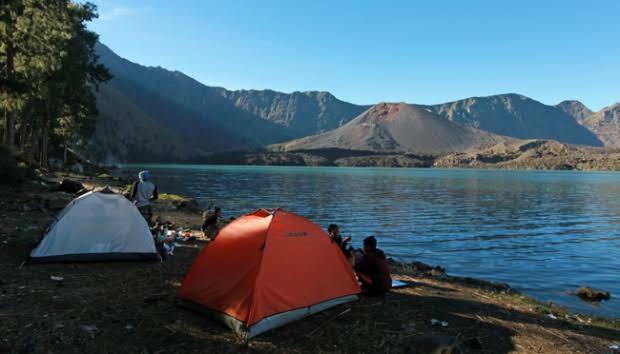 The promising charm of Mount Rinjani National Park which is very prospective is Segara Anak Lake, this location can be reached from two official route of climbing the Senaru ascent path and Sembalun climbing route. To visit Lake Segara Anak from Senaru route it takes about 7 – 10 hours walk (± 8 Km) from the gate of Senaru ascent route. 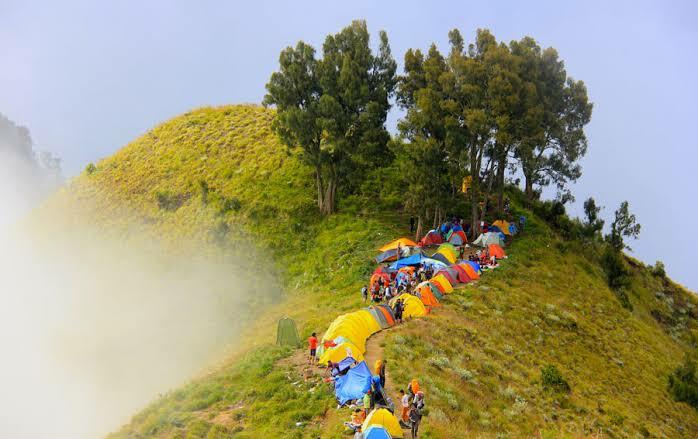 While the climbing route Sembalun taken within 8 – 10 hours. Segara Anak Lake with an altitude of ± 2.010 m above sea level and lake depth of about ± 230 meters has a shape like a crescent moon with an area of ​​about 1,100 Ha. Surrounding Segara Anak Lake there is a wide and flat land, can be used for camping / camping, also visitors can fish in the lake or soak in hot water containing sulfur. Another object around Segara Anak Lake is Hulu Sungai Koko Puteq ± 150 meters from Segara Anak Lake. In addition there is also Goa Susu, Goa Manik, Goa Umbrella, Goa Susu is believed to be a media of self-reflection and often also used as a place to meditate. While at the bottom of Lake Segara Anak there is a hot spring (Aik Kalak Pengkereman Jembangan) commonly used to test and bathe the magical objects (Sword, Keris, Badik, Spear, Machete, etc.) where if the objects become sticky when soaked it indicates the objects are ugly / do not have supernatural powers, on the contrary if the objects remain intact means that the object has supernatural power / is believed to have efficacy. Rinjani has the best panaroma among the mountains in Indonesia. Every year (June-August) visited by many nature lovers ranging from local residents, students, nature lovers. The average air temperature is about 20 ° C; lowest 12 ° C. Strong winds at the peak are common in August. In addition to the peak, a place that is often visited is Segara Anakan, a lake located at an altitude of 2.000m above sea level. To reach this location we can climb from the village of Senaru or Sembalun Lawang village (the two nearest entry points at an altitude of 600m above sea level and 1.150m above sea level). Most climbers begin the ascent of the Sembalun route and end the ascent at Senaru, as it can save 700m altitude. The Sembalun route is a bit long but flat, and the weather is hotter because of the sweltering savannas (cold temperatures but direct sunlight burns the skin). sun blocking cream is highly recommended. From Route Senaru incline without pause, but the weather is soft because through the forest. From these two locations takes about 7 hours walk to the ridge lips at an altitude of 2.641m above sea level (arrived at Plawangan Senaru or Plawangan Sembalun). In this place the view towards the lake, or to the outside is very nice. From Plawangan Senaru (if up from Senaru direction) down to the lake through a steep wall to an altitude of 2,000 mdpl) that can be reached within 2 hours. In the lake we can camp, fishing (Carper, Mujair) is an awful lot. Lombok residents have a tradition of visiting the tillers to soak in hot water pools and fishing. To reach the summit (from the direction of the lake) must walk up the western wall as high as 700m and climb the ridge as high as 1,000 m traveled in 2 stages 3 hours and 4 hours. The first stage towards Plawangan Sembalun, the last camp to wait for the morning. Summit attacks are usually done at 3 o’clock in the morning to look for a beautiful moment – the sun rises at the top of Rinjani. The journey to the Peak is quite tolerable; because pursue on the lips of the crater with a margin of safety that barely. Fields of sand, rocks, soil. 200 meters of the last height must be taken with great difficulty, because one step forward followed by half step down (mired rocks). Create a highlander – this is the most challenging and favored place because of the weight of the terrain paid off with its beautiful natural landscape. Mount Agung in Bali, Mount Raung in Banyuwangi and Mount Tambora in Sumbawa are clearly visible during good weather in the morning. To climb Rinjani is not necessary aids, enough stamina, patience and passion climber. 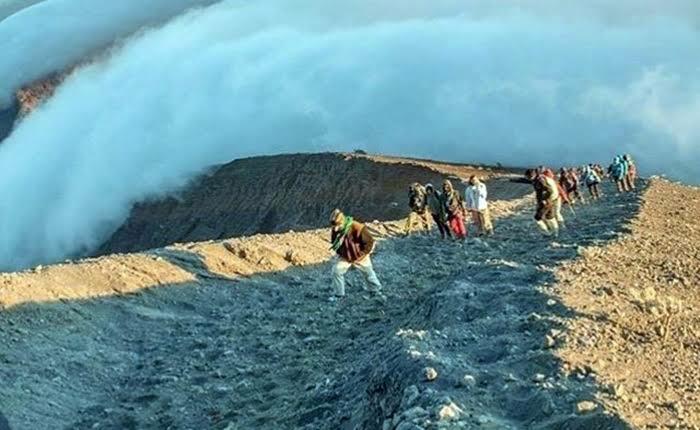 The entire journey can be accomplished in a three day and two night program, or if you want to see two other objects: Milk Cave and New Finger mountain (mountain boy Rinjani with new crater in the middle of the lake) it takes two days to travel. Logistics preparation is indispensable. 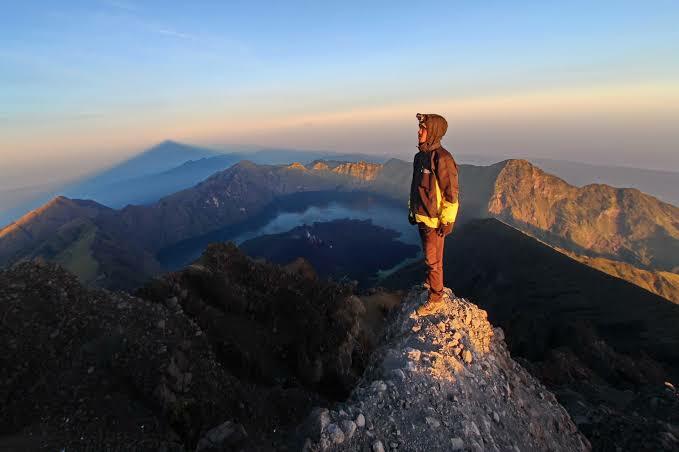 Are you interested in this adventure, reaching the peak of the world’s beauty through the summit of Mount Rinjani? 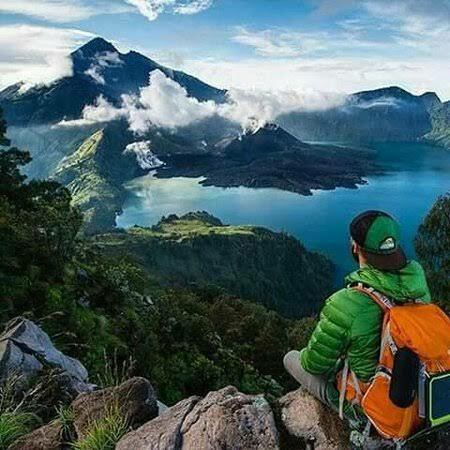 There are several trekking operators and personal trekking guide, where you can buy Rinjani Mountain treking vouchers. Ibu Susi hanya "LULUSAN SMP" tapi dia kerja beres, yang gak beres pasti dipecat. Thank you for your visit, I expect your constuctive suggestions and criticism to improve the quality of the display and informative contents. In order to always more useful to more readers.